Cliff Taylor, Managing Editor of The Irish Times, and Pat Leahy, Deputy Political Editor, react to the news that Apple have been ordered by the EU to pay €13bn in unpaid taxes to the Irish state. Independent Alliance Ministers were in contact with each other last night following briefings with Department of Finance officials and with their own independent advisers. However, sources close to Independent Alliance Ministers said that they had not decided whether to agree to an appeal, and would not decide until they meet before Cabinet this morning. Yesterday, the European Commission announced that Apple’s tax arrangements – which enabled it to channel profits earned in Europe and other markets outside the US through Ireland without paying tax on the bulk of them – constituted a form of illegal state aid to the firm. 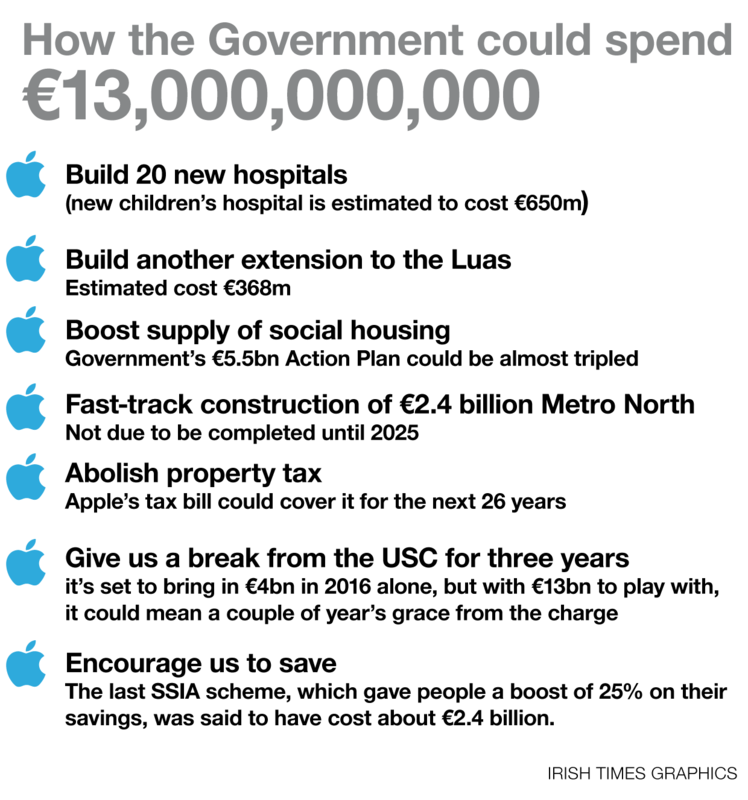 Consequently, the commission ruled, Apple must pay the State back taxes of €13 billion, plus interest – which by some estimates could add several billion euro. The unexpectedly large sum calculated by the commission took many in political circles by surprise, including a number of the Independent Alliance members who had anticipated a sum of €6 billion-€7 billion following briefings from Mr Noonan and his officials on Monday. It also precipitated a storm of criticism for Mr Noonan’s stated intention of appealing the ruling, with Sinn Féin and the People Before Profit-Anti Austerity Alliance group demanding that the State accept the money and begin to spend it. The EC issued a ruling on August 30th in relation to the tax arrangements of Apple in Ireland, where it has its European HQ. The EC said Apple had been granted selective treatment by Ireland through two tax rulings in 1991 and 2007. The EC has ordered Ireland to recover up to €13 billion from the tech giant. Minister for Finance Michael Noonan indicated Ireland would appeal the decision "to defend the integrity of our tax system; to provide tax certainty to business; and to challenge the encroachment of EU state aid rules into the sovereign member state competence of taxation”. Department of Finance officials confirmed that once collected from Apple in the coming months, the €13 billion sum, plus interest, will be lodged in an escrow account pending the outcome of the appeals process, which could take several years. Department of Finance officials and Ministers said that, even if Ireland loses the appeal and is ultimately paid the money, it will be required by EU rules to use it to pay down the national debt, rather than invest it in public services and infrastructure. However, this is disputed by Opposition TDs. Apple issued a statement rejecting the findings and saying the company now found itself required to pay tax to a government which says no tax is owed. “Keeping the money would mean accepting the commission’s hugely damaging analysis which would mean, agreeing that Ireland provided illegal state aid; accepting the commission’s encroachment into sovereign tax rights; and creating huge uncertainty for business in Ireland,” the document states. The Government also accused the commission of encroaching into an area – taxation – where it has no powers. However, announcing the ruling in Brussels, European commissioner for competition Margrette Vestager said that EU state aid rules applied to taxation as well as other areas of activity and were in place to protect EU taxpayers. “It has no employees, no premises and no real activities,” she said. EU politicians in Brussels widely welcomed the European Commission’s decision. However, the reaction in the US was predictably more hostile, with White House spokesman Josh Learner confirming that the Obama administration had been contacted by Apple executives in the wake of the Brussels announcement. The White House expressed concern too about the commission’s ruling saying that American taxpayers will ultimately foot the €13 billion tax bill imposed by the EU on Apple. 8 Ryanair cabin charges: what do the changes mean for you?